When watching old time movies and going through old photo albums, one can recognize the iconic style of writing known as cursive. In earlier times, before technology was so prominent, people relied on written communication in the form of letters to keep in touch. People would write in cursive to show elegance and thoughtfulness with every message they sent. It also required more effort to maintain a lasting conversation with people and having a pen-pal was very popular. But nowadays, there is no need for that because a text message delivers this information in less than a minute to anyone in the world. 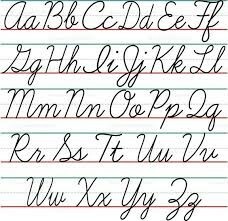 As a child, one can remember the assignments that required countless hours of solely writing in cursive. But now as an adult, smartphones and computers eliminate the need for this. Instead of cursive people choose to communicate using Calibri or Times New Roman font. The modern letters of the 21st century come in the form of text messages and emails which allows messages to be sent more quickly and efficiently. One no longer has worry about misreading a letter or not being able to read something that someone else wrote to them. Not to mention, technology and social media play a huge role in networking between employees and people of the modern working class. A lot of busy people in the world with demanding work schedules and real responsibilities have less time and even less patience to hand-write everything. Despite this, many still argue that a signature on any document requires cursive. Even senior Lianys Olmeda thinks that, “Cursive should still be taught because it helps to read historical documents and without cursive kids will only have the option to write in print.” Even though this is true, some businesses are allowing the use of a digital signature to sign important documents online. And people can even use a pre-made cursive font when typing a message on their computer or phone. With the growing demand for digital communication, the old-fashioned method of writing in cursive with pen and paper is destined to become extinct. Just like a vestigial structure in the body, there is no longer a use for cursive due to the evolution of technology in the 21st century.